In my previous article I discussed when we’re planting different crops. In this article I will discuss how much we’re planting. expected yield of garden: 517 lb. For perspective Kristin and I had one tomato plant, one pepper plant, and five carrot plants on our balcony last year. This is a big increase for us. However, it’s pretty small compared to the commercial vegetable farm at which I work. Roundabout Farm has about 15 acres and, considering pepper plants alone, about two-thousand plants. It’s even smaller compared to a modern corn, soybean, and wheat farm. Warren, if you’re comfortable sharing: How much area do you farm? About how many plants does your crop typically consist of? And what’s your total yield in pounds (or in bushels if the weight isn’t available)? 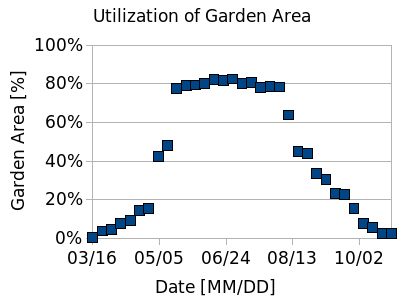 Below is a plot showing the amount of space we’ll actually be using in the garden throughout the growing season. There is a sharp increase in garden area after the last frost date. About the same number of items come out of the garden as go in during the middle of the season. Note that at maximum approximately 80% of the garden is used. We could grow more produce using the remaining 20% of the space, but the fragments are hard to use as successive crops are moved in and out. Crops are gradually harvested later in the growing season until area use drops to zero at the first frost date.